What is a millipede’s life worth? How can we possibly measure the value of a bug beneath the rotting log at the bottom of the old woodpile? I picked up the log to place it in the wood splitter, and there in the decaying oak leaves I saw a neat pile of brown and soft pellets, which I later learned were egg casings. And off to the side, coiled up, was the millipede, hiding her face in the mud as if ashamed by my discovery. My adolescent self got me probing, squeamishly, with a stick through the eggs, no doubt causing collateral damage. The millipede just curled up even more tightly. I felt bad when I awoke to my reckless stupidity. I always thought millipedes were dangerous, better off dead than out and about, threatening innocent children. But I was wrong. Millipedes can cause vomiting if eaten. They produce a bad smell when agitated. And, according to quite of few websites, they make “excellent pets”, as long as you don’t keep more than you can care for. Really? See for yourself. And best of all… as a prelude to mating, a male millipede will persuade the female to relax by walking on her back, massaging her with his feet, loosening up her tightly coiled body so he can access her soft underside. With tickly toes and amatory pheromones, he woos her. Millipedes are on my mind. Why? When I lifted up the log and saw the nest, and then another, and then another, it became clear that I lived in a millipede colony, or rather, a millipede ashram. Every piece of wood that I split that day held an entomological surprise – a hibernating wasp, a nest of termites, brown-patterned spiders, frantic earwigs – and while all the bugs scurried about, flying and crawling every which way, the millipedes turned deeper into them selves, spiraled like a perfect shell from a faraway sea. Three months ago I had a dream that seemed to have reconfigured my brain structure. The dream came at a particularly tumultuous time in my life when I was stricken by night sweats and heart-pounding panic. My mind would not stop spinning off with self-doubts and fears; I was questioning my ability to make good decisions, to live a well-intentioned and meaningful life. I felt lost. And then, finally, after picking through the muck, I happened to lift the right log at the right time, and like the millipede, the dream appeared. Just like that. The dream came while I was teaching at The Ojai Foundation. The program staff had put me up for the week in a canvas dome structure, situated far out on a path that meandered through the oaks. 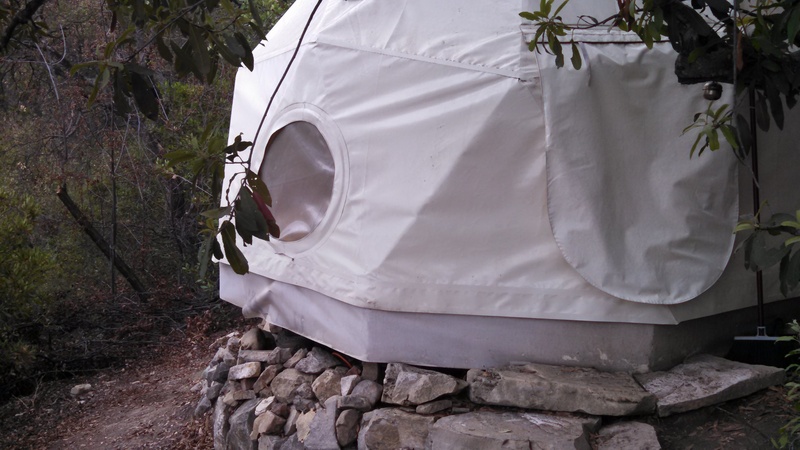 The dome had round plastic windows, like bug eyes, or a space capsule. Inside there was a futon, a small rug, and a vase of flowers. In the dream, I was no longer in the dome, but in the Eye of God. I was sitting crossed legged inside God’s cornea, peacefully gazing out on the universe. I mentioned to the group the next morning that being in the Eye of God is like being in the eye of the storm. While the world is blowing about fiercely, dangerously, in a wild and spiraled tornado, scooping up chairs, bicycles, mailboxes, and all the other stuff of life, including weapons of mass destruction and Keystone XLs, inside the Eye it is calm and beautiful. It’s like sitting in the middle of a band of whirling dervishes. It’s like being on mind-altering drugs. It’s that good. If only I could stay inside forever. I can’t. But the Eye remains, I know. 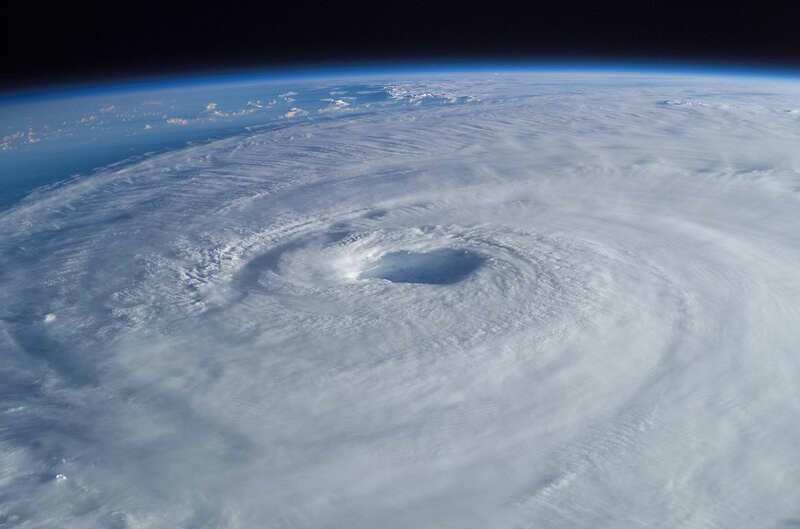 An image of Hurricane Isabel as seen from the International Space Station showing a well-defined eye at the center of the storm. 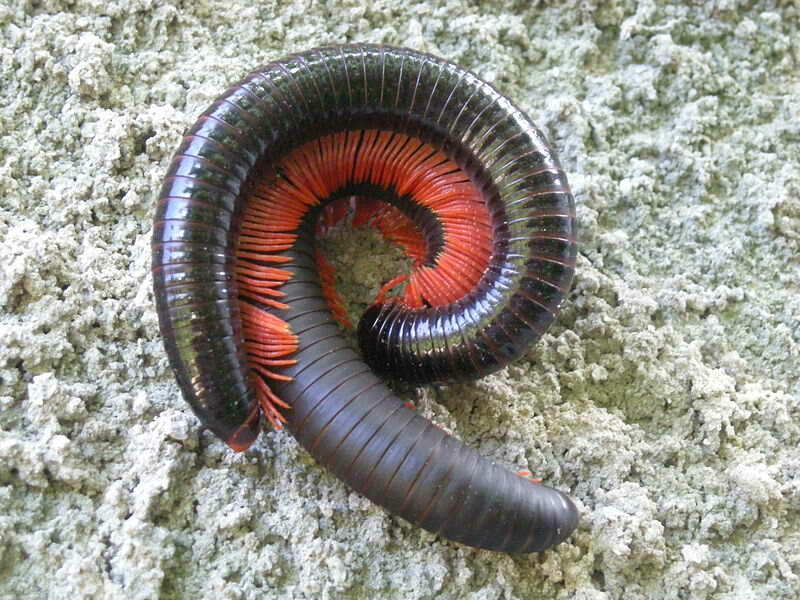 I like to think of the millipede as a child of God because the idea is so absurd. 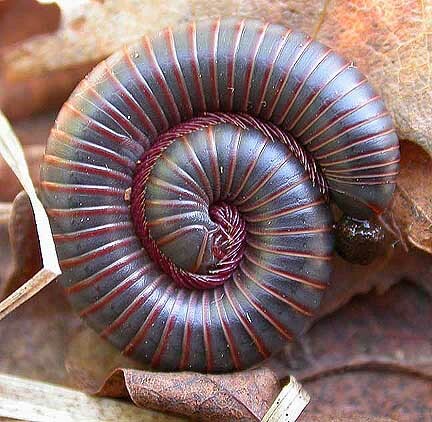 But, on the other hand, why is the millipede so symmetrical? Why so perfect in its design? Why in its spiral-mandala manifestation does it divulge an archetypal essence? To be archetypal is to be of the gods. Maybe the millipede is god. Maybe to sit in the Eye of God is to sit inside the center of the millipede, wooing her with a foot message. Maybe we are wooing the entire universe with our feet, walking as we do, out to the old woodpile for another log, opening her up to the soft underside of her being.